Hey Everyone! I’m super excited to share with you exactly how we are TRANSFORMING (I say transforming because we are not done yet) our exposed brick in our future playroom. Let me start off by saying that it has ALWAYS been a dream of mine to have exposed brick in some form in our home. I think it can add so much character and history to a home and can be such a charming feature when done right. So here was the problem: I did not like our brick. I thought the darker bricks were a little purply (that’s a word right?) and it had what I liked to call “white blobs” randomly all over. And then the worst part was the mortar. It was a cement gray color that just wasn’t attractive. I also really really tried to like it because my husband thought it was fine and that I was making a big deal out of it. We apparently weren’t looking at the same brick. Do you see what I mean? Do you see the random “blobbies” all over?? I guess it was supposed to have a “white washed” look but I just didn’t like it. Especially with the gray grout. Lastly, it was just so dark and sucked all the light out of the room. So when we started our carport/playroom renovation, our goal was to make this feel like an actual room and not a carport that we just converted (although I’m sure it will always be obvious) but I knew right away that I did not want to just cover up our brick because: 1) cost savings. It would have cost more money to frame out and drywall over the brick than it would to transform the brick into something we love 2) its a great way to add so much character to the playroom!! So the first thing I did was research. This included looking on Google Images, Pinterest, Instagram, and other blogs. I quickly found out that there were MANY different methods you could use to transform your brick. I knew right off the bat that I did not want to just paint the brick if at all possible. 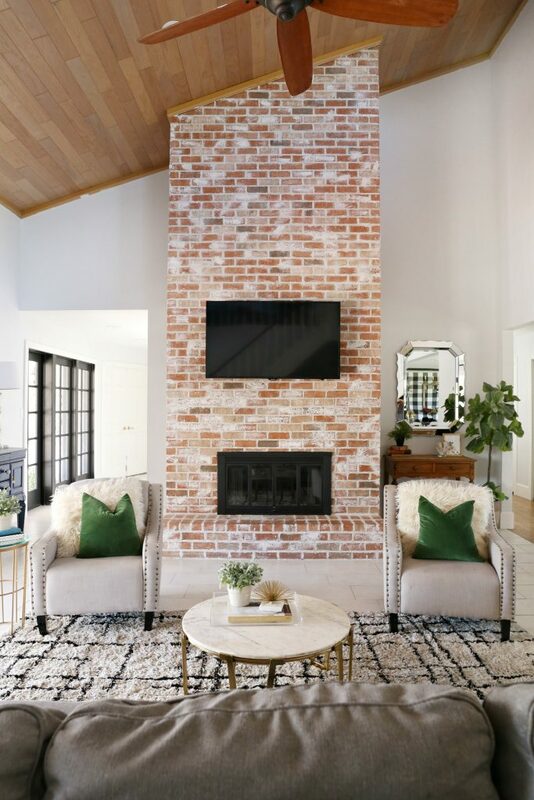 (not hating on painted brick – we have a painted brick fireplace in our living room – just not the look I was going for in here) I really really wanted an aged brick look that had lots of depth and character. So… besides painted brick, there was mortar wash/german smearing, limewash, and whitewash. Again, I knew that I didn’t want the painted look so whitewash was also out of the picture. So that left german smearing and limewash. Before we ever got started, I knew that I wanted to test and practice on some brick that would not be exposed. THIS STEP WAS SO IMPORTANT!! The biggest lesson I ever learned throughout all of our DIY and home renovation experience was to test everything and sample everything FIRST! The most regrettable moments in our home was when we didn’t do this. So I tried the German Smearing/mortar wash first (see the picture to the right). All of the how to’s of this method mentioned that you basically caked it on, let it set up for a bit and then used a wire brush or scraper to expose some of the brick to your liking. And this turned out okay… but not the best. My first mistake was to do this when it was absolutely freezing outside. It took FOREVER for it to dry and I kept touching it and lifting some of the mortar out because it wasn’t dry enough yet. Again, this didn’t look terrible but it just wasn’t to my liking yet (just personal preference). But I did feel like it made it look brighter and covering up the gray mortar was a good thing. I felt like I just needed to find the right method of using this material. So then I went in a completely different direction and I tested limewash. I had seen so many beautiful examples of limewash and how it could make new brick look really old and have tons of character. It also seemed super easy to do and I was really hopeful that this would answer all of my prayers. Limewash has basically been around forever and is a great method to use on brick because it lets the bricks breathe. It’s also awesome because you simply mix up the ingredients with water, get your bricks wet, slap it on and let it dry, and then take a hose pipe and spray it down to distress it. I thought this was going to be it and it would take no time to do. Well… I tested it and didn’t like it. By now you’re probably thinking, does she like anything?? I guess it was the fact that I had a certain look in my head that I wanted to achieve and this wasn’t it. But I didn’t know that until I tested it (see image below). The biggest deal breaker on the limewash was the fact that it didn’t want to stick to the grout lines very well for some reason. When I used the hose to distress it, it came right off the grout lines first which was the exact opposite of what I wanted. I wanted the gray mortar covered up, not highlighted! The look of the actual brick face was pretty cool limewashed but again, not what I was going for. So that’s when I saw Savannah’s post from their blog Classy Clutter (Classyclutter.net) about how she basically re-grouted her fireplace and I knew that this was the route that I wanted to take. Step 1 : Gather materials and prepare your area. Don’t forget to cover the floor with a drop cloth or plastic, especially if you are doing this inside. Step 2: Mix your mortar. A mixer attachment for the drill comes in really handy for this part! The consistency should end up looking like a Wendy’s frosty. If you feel like its not flowing out of your piping bag easy enough, add a little more water to the mix. You definitely don’t want this to be too runny! Step 3: Dampen your brick. I used a spray bottle for this step. Step 4: After filling up your piping bag about halfway (I turn the top part down as I’m filling it up to help keep things neat), start piping into your grout lines in small sections. My brick already had gouged out grout lines and a place for the mortar to go so I’m not sure if this would work if your grout lines are already flush to your brick. Start with the horizontal lines first and then fill in the vertical lines. Step 5: The easiest/hardest part: Waiting for it to set up. Depending on your climate and temperature, this part will vary. (I tested this method in the early spring when it was still cold and it took FOREVER for it to dry. But now that I’m doing this in June/July, it is drying much faster!) Just keep testing the mortar (with gloves on) to see how much it has dried. If it comes away with you on your gloves, then you know its not ready yet. I have learned that if its dry enough to leave your gloves dry but soft enough to leave a finger print, then it is perfect! Don’t wait too long or it will not be able to be manipulated and that would be sad! Step 6: Before I even start smearing, I take the handle of the wire brush (you can use any handle of any tool for this part as long as it gives you the results you want) and rake it along the grout lines to make sure they are even and flush with the brick. This also helps me to catch any places that I missed with the piping bag. All I do is take some extra mortar that I have raked off (you will have a good bit) and smush it into those places with my glove. I had to keep telling myself that this wasn’t supposed to look perfect so its okay if there are places that need more mortar, you can always add more later. Step 7: Start smearing that mortar! I really wanted a lot of the brick to show through the mortar (I’m not going for the “completely caked on but only in a few places” look) but wanted to give it an all-over even “mortar washed” look with messy grout lines. This is the part that gets really messy so make sure you protect your floors and yourself! I simply rubbed my gloves all over the brick to smear the mortar around and it gave me the perfect look that I was going for! In a few places, I added some extra dried mortar to give it some depth and character. So this is the result!!! Can you believe this is the same brick??? The “blobbies” are still there but at least they’re hidden now 🙂 Doesn’t it look so much brighter and better!!?? We couldn’t be happier with the results and I can’t wait to get the rest of the room finished! Stay tuned for more playroom updates! The minute we started our carport (future playroom) renovation, I knew that making sure there was A LOT of natural light was going to be important to me. One day I noticed that in the evenings when we had our (future) powder room door open, there was a lot of natural light being flooded into the room through the bathroom window. And because the bathroom door swung into the playroom rather than into the bathroom, I knew that we would most likely always have that door closed. So my first idea was to make a transom window to go above the bathroom door. That way the door can stay shut but light can pass through into the playroom. This idea was perfect! Plus how cute are interior transom windows!! All of my beautiful transom window dreams got squashed. And the only other place it could go was above where the TV is going to go and that’s just not going to happen. So I told my husband that since I can’t get the transom, then the second best option is to get a frosted glass door to allow at least some light back into the playroom. I started looking online and realized that for a 36″ door with a 1/2 lite window was going to be really expensive and way more than I wanted to pay (not exactly in the budget). I was looking at at least $500 and up for a door of this size. (It was originally a carport utility closet door – that’s why it is so wide) Then I had the idea of possibly getting an old vintage door and fixing it up. I went to every antique store and ReStore in town with no luck. And the ones online were still just as expensive. Finally I went to this hole in the wall antique shop that had plenty of vintage windows and doors and found the perfect door!! It was 36″ wide and 85″ tall. (It will need to be cut down to 80″ but that’s ok) It had already been dipped and stripped and was now this beautiful light oak color that I adore! Now don’t get me wrong, I know it needs some work (some sanding, sealing, a knob and glass) but I think it will be SOOO beautiful in the end! I will keep you updated on everything door related so look for that in the future! I hope you love it as much as I do! Let me know what you think and if you have any suggestions or questions! Our Exciting Plans for the Garage! Hey Guys! Thanks for tuning in to see what’s got us all excited around here! We are turning our carport into a Playroom/Bonus room! Okay okay, so maybe its not the most exciting thing you’ve ever heard but we’re pretty pumped about it! So I would love to back up and talk about what made us make this decision and why we are doing this now mid-bathroom renovation. OK so for a little background knowledge of our house, when I was little, my Grandfather wanted to invest in real-estate instead of stocks or other types of investment. He had 6 grandchildren and wanted to buy each of them a house so that when they got married, they would have a place to live. Many of you would think that that’s amazing and so cool! And it is! BUT… my grandfather did not go and buy 6 mansions. He bought southern ranch style houses that needed a lot of TLC. I know that some of you will be reading this and think that I’m being ungrateful. But I’m just being real and honest with you guys. My dream house is not a simple rectangular brick ranch house that needs a lot of updates. BUT… I know this house was a gift (given to us free and clear – and NO MORTGAGE!) and I know how much of a blessing that is! But at the end of the day, I still really REALLY REALLY wanted to move. There were LOTS of reasons for this. Probably the first thing that started me thinking about it was the fact that my older sister moved from her (given) house to a fancy new house. This house has tall ceilings, lots of windows, plenty of room to spread out, a bonus space upstairs and a great yard/deck outside. So of course it was very hard to not feel the pangs of jealousy (and to check my Zillow email everyday for new listings). Sure it would be nice to have a sprawling kitchen and a grand master suite, but really those things listed above were always my top two complaints about our house. ESPECIALLY now that the dining room has become one big playroom. Basically between my husband and I, our life turned into and episode of Love it or List it on HGTV. Now John was never against the idea of moving (eventually), he was just not in such a big hurry like I was. I knew that it wouldn’t be an immediate thing because there were still some updates that needed to be done to sell the house and we needed to get some debts settled and paid off (don’t we all amiright) before we could seriously start looking. But I’m the kind of person that once I get an idea in my head, I can’t think of anything else sometimes. So all I could think about was what we needed to do to be able to move. I had a 5 year plan of renovations that would be purely based on resale (hence the bathroom remodel) and somehow along the way we would magically get out of debt too. Well John wasn’t immediately on board with this idea. He honestly didn’t see what the hurry was and didn’t think our house was that bad. So that stopped me in my tracks. I was sure that he thought exactly like I did! How could he not! Well… it turns out he makes some compelling arguments. First of all, we are in a house without a mortgage. And secondly, we are in a house WITHOUT a mortgage. Okay, so he got me there. But I eventually won him over and explained to him how the house didn’t have certain things and how it couldn’t grow with us as a family. But honestly, something inside me felt wrong about it. Here we were with this huge blessing and I just felt very selfish. Now there is nothing wrong in wanting better things for your family, but I needed to look at the bigger picture here and my motives. Sure we could have a bigger, newer house, but was it the best move for our family financially? I knew the answer to that was NO but it took awhile for it to sink in. Sure we could try our best to become debt free in five years but what does that mean? No vacations, no eating out, scrimp and save every dime so that I could what? Have a fancy kitchen island and a prettier house to show on Instagram? I just really felt like God was telling me that I need to look at what was best for the family right now, not 5 years from now. Now let me just say, there is nothing wrong with trying to get out of debt. In fact, we will still be working on this even if we don’t sell the house. And there is nothing wrong with saving up to have something better or bigger if that is your desire. And there is even absolutely nothing wrong with wanting a beautiful house with tall ceilings, and lots of natural light, and a huge kitchen with an island, and a grand master suite with a huge shower with multiple shower heads. But sometimes God says, “Stop. Take a deep breath and get a new perspective.” So this month, out of the blue, the idea of turning our garage into a playroom just hit me. I was looking around at all the toys that were taking over our house (especially after Christmas) and I just knew it was the right move. I brought it up to John and he thought it was a great idea (surprisingly) and was immediately on board! I knew it was a God thing because he is NEVER 100% convinced of my ideas at first. The other thing that convinced him of it was the fact that at one point, the carport was turned into a room (by one of the renters of the house) in the past. So we knew it could be done. and Add all new siding and exterior finishes to the outside. We are SOO excited to get started and I can’t wait to have this space for my family! Please excuse the mess (keeping it real) and quality (just my from my phone) of these pictures. This will give you an idea of the space we will be working with. We still have a lot more planning to do and lots of stuff to figure out but I’m BEYOND excited about this space! Keep a look out for updates as we tackle this project!